Practice is an essential part of learning anything. 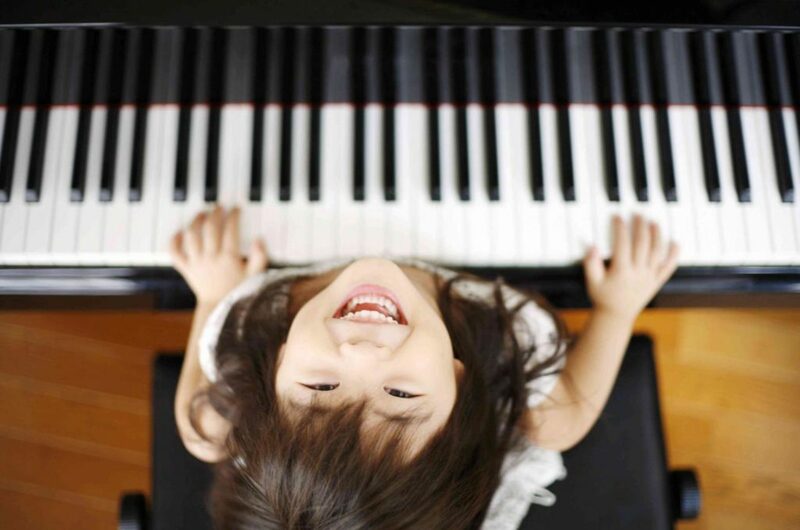 And, having a piano or keyboard at home for students to practice is a key to their success with music lessons. Below are a range of decent and extremely affordable keyboard options, starting with one that is just the cost of a single lesson. If you or your child takes piano lessons and doesn’t already have a piano or keyboard to practice on at home, this is a great place to start. All students should have a convenient instrument to practice on every day of the week. In the future, I will put together similar lists for more advanced piano options and other instruments. Please Note: I have not tested all of the instruments and options recommended below. I have chosen these recommendations mostly based on three factors: included features, overall perceived value, and word-of-mouth/online reviews. I encourage everyone to do their own research before making a purchase. If you indeed choose one of the options listed below, please use the links in this post to make your purchase. A small portion of the purchase amount will go towards a budget for improvements and upgrades to the instruments used during private lessons. Update: It has been reported that this keyboard is missing an important feature most students will need called multi-key polyphony. Without this feature, a keyboard will not make the sound of more than one key pressed at the same time. As such, I now only recommend this option for very young beginners (kindergarten or less). If you are currently taking lessons and don’t already have a piano or keyboard at home, this is the perfect place to start. Currently priced at just $40, it is at the far opposite end of the piano spectrum from a Steinway grand. But, it is lightweight, has an impressive 61- keys, and is extremely easy to store just about anywhere, such as under a bed. For most keyboards, you will need to either set them on your own furniture or purchase a stand separately. 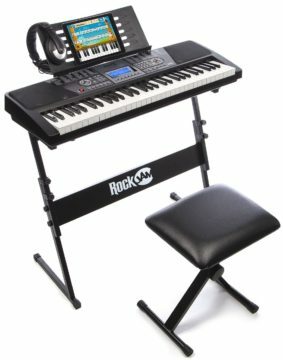 This keyboard set comes with it all: keyboard stand, music stand (for books and sheet music), bench to sit, and even headphones so you don’t bother your family. All for $119. The keyboard itself is a step up from the Plixio above, but is definitely not the quality of the Casio below. All in all, it is a good middle ground between the two and has all the accessories you need in the same box. Want the package that also includes a sustain pedal for jus $30 more? Click here for the upgraded kit. It’s rare that you’ll see a Casio piano/keyboard used professionally. But, Casio is a solid brand that has been around for more than half a century. Their keyboards make for great, affordable instruments for beginners to practice. And, they usually have quite a selection of additional features built in. At $179, this keyboard is no exception. In particular, it has touch-sensitive keys. The softer you play, the quieter it sounds. This is very helpful for beginner and intermediate students learning to play with dynamics. Few beginner students need 88 keys on a keyboard. This is the size of a full piano. But, this is not only the most affordable 88-key option currently available, it is also from a very trusted brand. Alesis is will known for making quality electronic instruments such as keyboard, synthesizers, and even electronic drum kits. My personal keyboard is an Alesis and it is currently one of the two keyboards I use with the students at school. At $210, this will definitely cost more than the Casio and will likely have less of the “fun” features. But, the real advantage of this keyboard is that it will play and feel a lot more like a piano. It won’t quite be as good the “real thing”, but it may very well be the only keyboard the student will ever need. A step up is touch-sensitive keys for changing volume as you play. And, semi-weighted or weighted keys will give a better feel of piano. Anything that says “digital piano” is a usually step in the right direction. The best brands are Roland, Korg, Yamaha, and Casio. Alesis keyboards are nice too, but do not have built-in speakers. Guitar Center is a good place to start, especially since you can then pick up the keyboard locally. Also, check their Clearance and Outlet (open box) sections for special deals on new(er) items. Craigslist also has a lot of great deals. Just be safe and avoid scams. Musician’s Friend also has several categories to check out. They have open box sections for Keyboards and Digital Pianos. And, they have regular “Hot Deals” and Clearance items.